Look at what I found in the corner of a little store out here in the middle of nowhere! Did you know we had a pink sky? My old, broken camera sure thinks so. Thank goodness we bought one of these which we will retrieve when we visit California next week! Rain sticks, or palos de lluvia, are an invention of Chilean natives, who used them prior to the arrival of the Spaniards in order to summon the rains. Rain sticks can be made from cactus or bamboo, and consist of a hollowed out shoot into which the cactus spines or nails are embedded in a spiral pattern. Small pebbles and seeds are closed within the shoot, and tilting the rain stick causes the pebbles to shower past the nails, thereby producing the rain sound. When I started teaching in Creel, a rain stick was already in use in the classroom as a preparatory exercise for the Silence Game. At the beginning of the year, I give Grace and Courtesy lessons on what to do when you hear the rain stick. (Model stopping all movement and closing the eyes.) 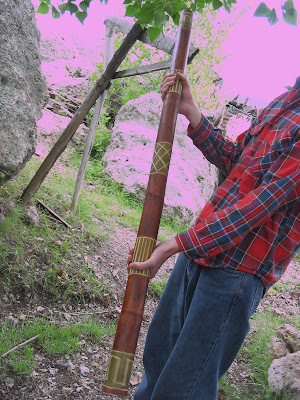 Once all of the children have had the lesson, I can "play" the rain stick at any moment in the day, and all of the children stop what they are doing, close their eyes, and experience several moments of silence and peace. Once I notice that one or more children start fidgeting, I say quietly "You may open your eyes and return to your work." Here's a link that explains how to make your own rain stick.